J.D. Power and Associates released its annual list of credit card satisfaction survey today and for the fifth year in a row, American Express tops that list. In fact, it tops it with a big gap between the number one and number two spots. So, with that in mind, we thought this would be a great time for an American Express credit card review. Here are some of the AMEX products that helped earn its number one spot on the list. Part of the reason for such high marks in customer satisfaction is due to the versatility of the American Express name. It offers several business credit card options that work well with companies of any size. The SimplyCash business card offers a 0% APR on purchases for up to twelve months. Just as impressive is the absence of an annual fee, which is always welcome news for a business owner. You can earn unlimited cash back and additional cards, which is a necessity for most companies, arrive in your mailbox at no cost. Also, be sure to take a look at the JetBlue Business Card, too. While there is a $40 annual fee for this card, the perks more than make up for it. For consumers, the Blue Cash is often their first choice – and for good reason. This American Express offers a no annual fee card with the flexibility to split your payments over time. Plus, you’ll enjoy cash back offers, including up to 3% cash back at supermarkets. While there are many who like the idea of rotating rewards categories, there remain just as many who aren’t necessarily drawn to them. If you’re one of those who aren’t really interested in this perk, you’ll be happy to know the Blue Cash AMEX doesn’t come with this benefit. What it does offer, however, is a $25 referral bonus any time you refer a friend or family member and they are approved. It’s a straightforward credit card offer that manages to keep the complications away without stripping card holders of those benefits they’re most likely to actually use. Ah…the classic card that American Express is so well known for. This offer is made for those who love to travel as it offers special travel packages you won’t find anywhere else. There is a $175 annual fee, though it’s waived your first year. Also, you should know that additional cards associated with your account have a $35 annual fee if you have more than five cards on the same account. If that’s not the case, no worries since those fees will be waived each year. All of the latest in fraud technology is built in too. 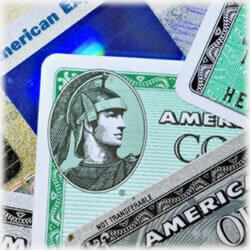 The American Express Travel Service is also a part of this card offer, along with many more perks and benefits. American Express has several co-branded cards and some of its partners include Delta Airlines, Starwood Hotels and Costco. These cards offer great savings when you shop or buy with the partner and using your card to purchase those services and goods results in even bigger savings. Depending on the card, the perks will vary. For instance, the Costco card has no annual fee while the Delta Reserve offer has a $450 fee, so be sure to check the terms and conditions. Finally, don’t forget American Express offers gift cards for consumers and businesses. These make great gifts for employees, friends or family members. The gift cards reiterate the “total package” appeal that defines the American Express model. Choose any denomination between $25 an $500. Holidays, graduation and even wedding gifts – this is the one size solution that everyone can appreciate. As you can see, it’s great offers like these that keep customer satisfaction so high. Whether it’s a cash back credit card or one with no annual fee, there’s sure to be the right American Express that meets all of your needs in a credit card.